It’s no secret I love pickup trucks. The bigger the better. 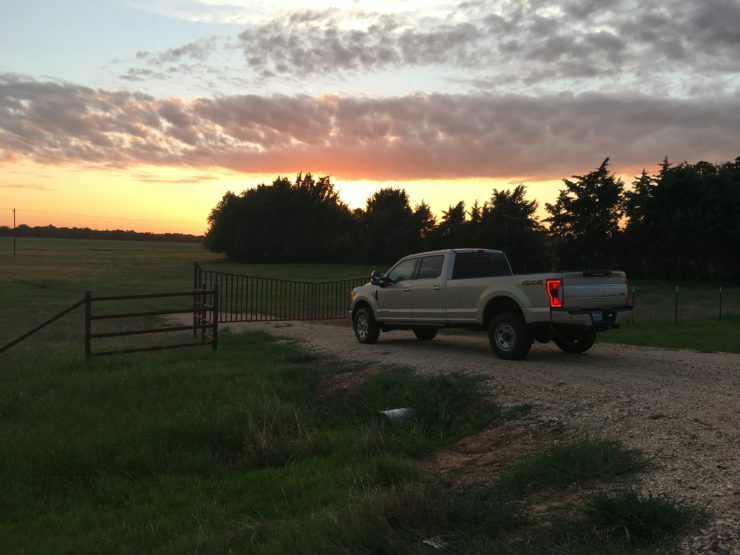 I’d driven the 2017 Ford F-350 Super Duty before, but had a chance to use it again when we moved. Ford was gracious enough to load it to us for two full weeks and boy did we enjoy it! If You’re Looking for a Work Truck, the F-350 Super Duty Platinum Is the Truck for You! The model we drove was not a dualy, but was a diesel. This 6.7L V8 engine is paired with a 6-speed automatic transmission. And my favorite part? 176″ wheelbase. This means the bed of the truck is HUGE! A lot of crew cab trucks sacrifice bed space for cabin space, but not the F-350! Having this truck for 2 weeks allowed us to really get to know it. We averaged 18 miles to the gallon on our country roads, which isn’t too bad considering we were almost always hauling things like boxes and heavy furniture. I also discovered that Ford’s auto headlights and adaptive cruise control have improved a lot in the last couple of years and I was really pleased with how intuitive they are now. The bed lights and tie downs were really helpful when it came to moving or hauling big loads late in the evenings after work. And of course the Tough Bed bedliner gave us a sense of security while loading and unloading. The white gold exterior of this beast is stunning. Everywhere we went people complimented the color. It’s not white and it’s not gold. It’s white gold and it’s perfection. I’ve since seen one in our little hometown and I still think it’s one of the prettiest trucks on the market. A tank I tell you! The F-350 Platinum Is Luxurious. But not too much. I’m not a huge fan of the King Ranch series of truck. They always feel older gentlemanly to me, and just a little too western luxury. The Platinum is just right! You get all of the creature comforts, including all leather interior, with more of a work truck feel. Adjustable pedals and telescoping steering wheel, ambient lighting, 10-way drivers seat, heated and cooled front seats, massaging seats (can we all just pause for a moment and appreciate the beauty of this?) and a heated, leather wrapped steering wheel are just a few of the interior features that will leave you feeling spoiled. And the technology is top-notch too! Of course you get the SYNC3 system with an 8″ touch screen. And power folding and telescoping mirrors which make getting into tight places and pulling trailers so much simpler. Personally, I’m adding those small trailering mirrors under the sideview mirrors to my wish list cause I really loved being able to see the entire side of the truck and knowing exactly where my rear wheels were! Would I Buy an F-350 Super Duty? If I had a legitamate need for something so big and so powerful, yes. If I had the money just laying around? Yes. But I have neither and my pickup needs fall more along the lines of an F-150 Lariat 4×4. Sad, but true. Still, I get a kick out of driving these massive work trucks and can’t wait to do it again! The first time we had the F-350 we had driven it for a day and a half before a rear tire picked up a massive bolt on the highway. We ended up with a flat without the tools to fix it and had to rely on a local wrecker service, Pitcock 24-Hour Wrecker Service and our amazing local Ford dealership, Paris Ford Lincoln to help us out. These guys had us fixed up in no time and back on the road! That’s the first time I’ve had issues with a loaner vehicle and boy did it make me nervous. How would it be handled? Turns out, very quickly and painlessly and I’m so grateful for everyone from Ford’s fleet manager to the local guys for making it a good experience!